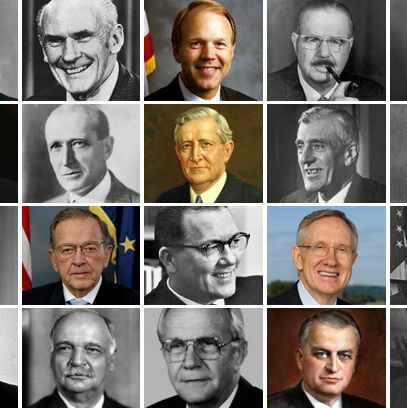 How Well Do You Know America’s Senate Minority Whips? The Senate minority whip is a very important leadership position tasked with “whipping up” (not literally!) support among members of the minority party for important pieces of legislation. But how much do you know about the men who have served as Senate minority whips throughout American history? In honor of the 98th anniversary of the election of the first-ever Senate minority whip, we put together this quiz to test your knowledge. This Senate minority whip was born in Geneseo, New York! This Senate minority whip’s mother died when he was 3! This Senate minority whip was both preceded and succeeded in the Senate by a man who also served as a Senate minority whip! This Senate minority whip served as the mayor of Pawnee City! This Senate minority whip won a debate against a future president while both were in high school! This Senate minority whip worked for his uncle’s law firm! This Senate minority whip’s second wife was a descendant of Peter Stuyvesant! This Senate minority whip played semiprofessional baseball in his youth! This Senate minority whip served as an executive with the Tobacco Institute! This Senate minority whip was buried in Hillcrest Cemetery! How Well Do You Know Our Senate Minority Whips?